If I'm being honest the last couple months I have felt overwhelmed with life and underwhelmed with creativity. We all have experienced that before, so this is nothing new. Yet what we don't talk about is the importance of taking a break - or a step away for a while. Some creatives don't believe in that but this is something I have found works for me....at least for right now in life. I noticed I was creating stuff just to create. I was posting things just to keep up. I was interacting with people just to not feel left behind. I had no energy to make anything new, and I was uninspired. I see the same things everywhere and I was desperate for an escape. I don't know if it's the fact that I'm a Pisces and we inherently desire to escape. Whether that be through a good book, travel, a movie, music, etc.... we believe the only way to face reality is to escape through a fantasy world sometimes. I have to agree with that. Every so often if I'm not careful I can easily feel "stuck" creatively. I feel like I have nothing to give and it keeps me from doing what I love. I noticed every time I'm beginning to feel this way there are 5 signs that always pop up. You'd think I would be able to learn them all by now enough to never feel "burnt out" but no. Now that I'm aware of them hopefully I can be prepared and proactive. I decided to share them with all of you guys out there since I do have a good amount of creatives reading my blog. I hope this speaks to you. Even if to remind you that you're not alone. That there are plenty of people out there that lose interest, inspiration, and motivation towards the things they love most in life. But there are ways to combat those negative feelings, we just have to see it coming. Maybe you experience these 5 signs and if so, here's what I do to fight them. #1. When You "Don't Have Time." This may seem a bit weird because as a creative you most likely will keep busy - and you like that. By "Don't Have Time" I mean that you constantly feel this race against the clock, this time pressure so you use that as an excuse towards everything. Your friends ask you to hang out, "I don't have time." Your mom wants you to call her and catch her up on your life, "I don't have time." You are alone and would rather watch Netflix or do a face mask "I don't have time." You constantly feel as though you are racing to get ahead, running out of time to do what you need to do. If only you had more time. If you had more time you could be more creative. If you had more time then you can devote it to a relationship, or friends, or quality time with loved ones. When you catch yourself not having time for the human part of you because you are trying to take care of the creative part of you - take that as a sign of trouble. Also, it may be a sign you need a planner and a day off. If you have the privilege of being able to do the thing you love as a job - a career then, A. Good for you! Wow! Do the damn thing! B. Find something else you really love outside of your job. Here's why. You will have deadlines, you will have a budget, you will have a boss (even if you're freelance) and all of those can (to the creative artsy soul) feel like 'limits'. These 'limits' can make the work feel like work. It starts feeling like something you "have" to do rather than something you "get" to. Now, if you don't have the luxury of doing something you love as your job then, A. Don't worry. You'll get there. This is the best time to mold yourself and create anything you want. + B. You are still capable of feeling this. You may work a 9-5 but to 'keep up' or to 'stay relevant' you create. If you feel as though not posting puts you behind, or not creating makes you irrelevant then I challenge you to take a break. Re-evaluate your motives, true passions, and goals. Ask yourself what it is you want out of your work? Where do you hope your work takes you? What kind of people do you want your art to reach to? Lastly, why did you start doing this in the first place? For those of you who watch good films and have seen 500 Days of Summer, remember that scene where Tom (played by the incredibly talented Joseph Gordon-Levitt) walks to work super cheerful? Hall & Oats plays, the fountains shoot up at the right time, he dances around like no one is watching, and he high-fives the mailman? Yeah - that's pure joy. I can barely say hello to the barista in the morning let alone high-five a mailman! Well, we can't always feel like that I understand, but creating art that we love and are proud of can make us feel like that sometimes. If you're reading this and that scene is far from where you've been lately - you relate more to the scene where he walks out in a bathrobe drinking alcohol from a brown paper bag, then maybe it's time to take a step back. Taking a break doesn't mean you're not happy, or that the work doesn't make you happy - it just means you want to breathe and go back to the energy that your art used to bring you. There are so many things that keep us from feeling excited and ready to make anything, but there's no way of knowing what they are unless we sit back and give ourselves some time. I've had those nights (hell, days) where I'm just going through the motions. I'm just doing my daily routine and I'm counting down the hours till the day is done. I'm so lethargic and there's no specific reason. I just feel tired but yet when bedtime comes around I'm tossing and turning. Now I am one of those people who gets a lot of ideas late at night and therefore I stay up till I get whatever idea it is out of me. But this kind of tossing and turning doesn't result in some oscar award-winning genius idea, it's usually just a restlessness you can't explain. This may tie in with the above sign (you're always in a bad mood) but because you're so tired, you may not seem like yourself. Maybe your friends and family notices that something is off. You could find yourself in a creative funk because you're stuck in a routine. If you're doing anything creative with your life you are probably someone who hates routine. Or maybe just someone who needs to switch it up every once in a while. There are humans in the world that thrive in routine, in the same thing day in and day out - but that's not you. Somehow, someway you've got caught in that and it's time to put that to an end. This can happen without you even realizing it - routine slips into your life so quietly but overtime it squeezes all the art out of you and you're left being a slave to the task. This happens to me too often and usually, I combat it with something to look forward to. I plan a weekend trip to NYC, or MIA to get away. I look up local concert venues to see if they are hosting any of my favorite bands. I plan something fun and "not-so-every-day-stuff" in my life so I have something to look forward to. Most of the time being able to look forward to something exciting and rare gives one the motivation to work up to that point.....then once the trip happens or you dance the night away at this concert you're leaving with the energy and passion you need to get back on your creative feet. 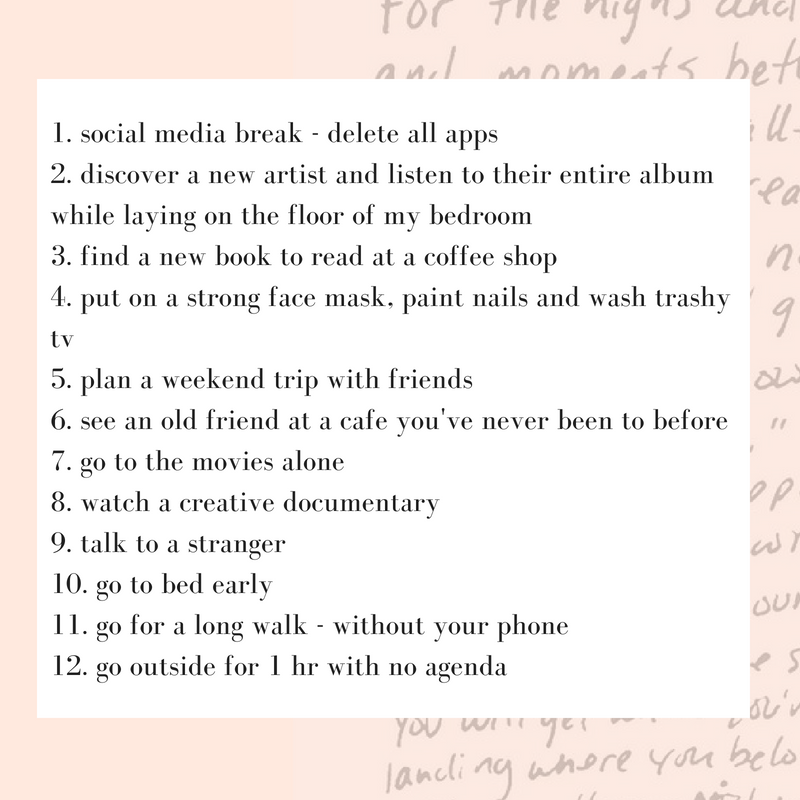 Here's a list of 12 ways I "take a break"